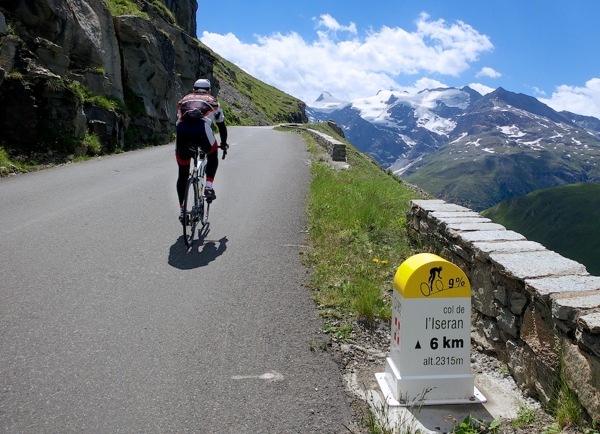 For more Alps bike-only days see here. The north side from Bourg St.-Maurice is the longest climb in France (47+ kms), but honestly it’s only interesting above Val d’Isére where the bike-only stretch started. Below has more traffic and a set of terriblly lit, dark, wet tunnels near Tignes. So I was happy to to skip the lower slopes. 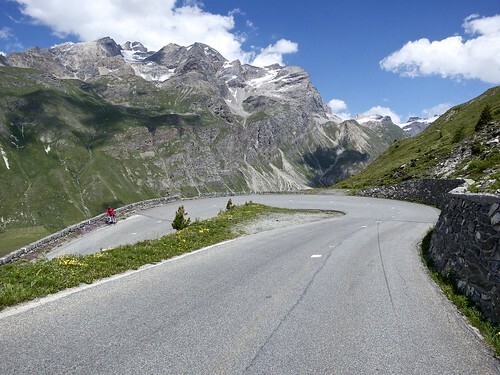 Similarly, I climbed the south side from Bonneval-sur-arc which is where the road turns up – for details of a longer version of this side starting from Lanslebourg see here. Bike-only days means cheerful cyclists. I started with the first pack and the roads where wet after some early morning rain – but the weather was perfect for the remainder of the day. Honestly, about as good a day of high-altitude cycling as possible. 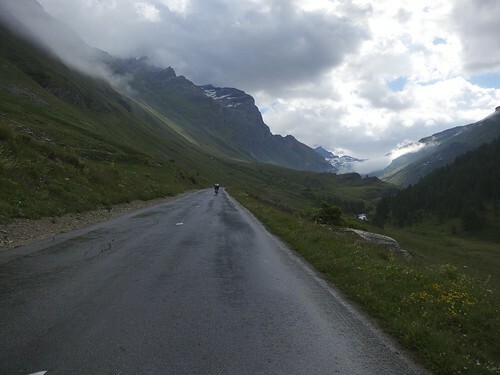 Previous Article2012 Tour de France Stage 11 Preview – Madeleine, Glandon, & La Toussuire. Next Article Tunnel (Col) du Parpaillon !! Thanks so much for all the info. 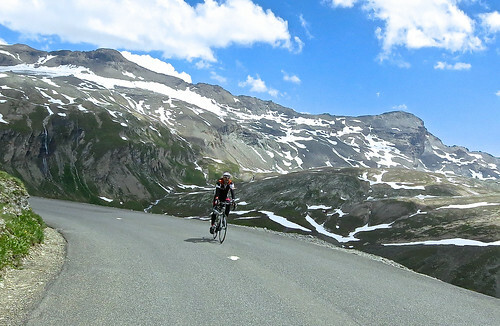 Planning a trip at the moment to tackle some of the cols and your information and opinion is really helpful. Sounds like you’ve had a busy month or so! Just a quick correction for this article though. 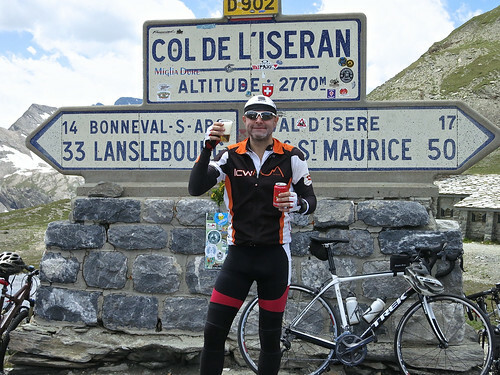 You mention climbing the north side from Bourg d’Oisans… I think you mean Bourg St Maurice? So many Bourgs, so little time! Hi Will, Great information on the site. A group of us are down in September to do the Marmotte route. I am coming down a day early and was wondering if I could manage the Iseran and the Madelaine in one day. We are staying in Maurienne and I was planning on getting the train to Modane and starting there. Garmin Connect suggests I can cut across to Moutiers via Tignes. On Google Earth the route looks stunning but wondered about the suitability for a road bike. Thanks for your help. Careful, there are only two paved roads that go over the Alps here, Madeleine and Iseran. There is NO short cut between Tignes and Moutiers. 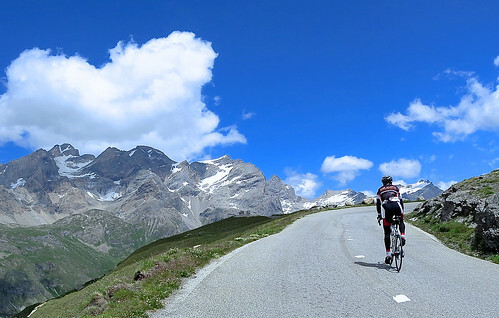 The Loop from Modane would be –> Lanslebourg –> Bonneval-sur-Arc, then climb south side of Iseran, descend north side past Val d’Isere (and past turn off to Tignes) all the way to Bourg St. Maurice. Ride through Aime on way to Moutiers. then up the valley to Feissons-Sur-Isere (base of Madeleine) then up Madeleine, then down into Maurienne valley at La Chambre. There is no other paved option. quick question. we are going to be coming towards iseran in late june. we can either do iseran or make the turn and do cenis. Which do you prefer? South side of Iseran is far more fun than French (north) side of Cenis. Great climb.